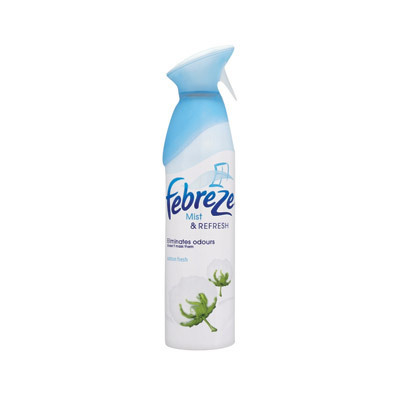 Developed by one of the industries leaders, this Febreze Air Freshener Cotton Fresh 300ml x 6 multi pack is the ideal addition to your janitorial stores. Developed to effectively eliminate odours rather than machine them, the unique technology captures unpleasant smells and neutralises them to leave behind a light and pleasant fragrance in all environments. The mixture is water based meaning it leaves behind no residue while evenly spreading across a wide surface area with the bespoke trigger system fitted to each bottle. This larger multi-pack features 6 standard 300ml bottles that can be distributed throughout your janitorial work force and stored away safely for future use. Embrace richer and more floral fragrances within your home or workplace and opt for our Jasmine Air Freshener 350ml instead.